Though this article was more or less ready to go before Christmas I have only just gotten around to formatting it. Sorry again for the delays - a combo of work pressure and family responsibility have really stretched me thin recently and I heartily apologise. With the minos out of the way I only had a few things to finish off for the tournament. Fully aware that this was going to be the last ride for my old beasts and likely to carry over for a while as stand in models while I adjust to the new book I tried only to add things that should carry over tot he new book without too much worry. 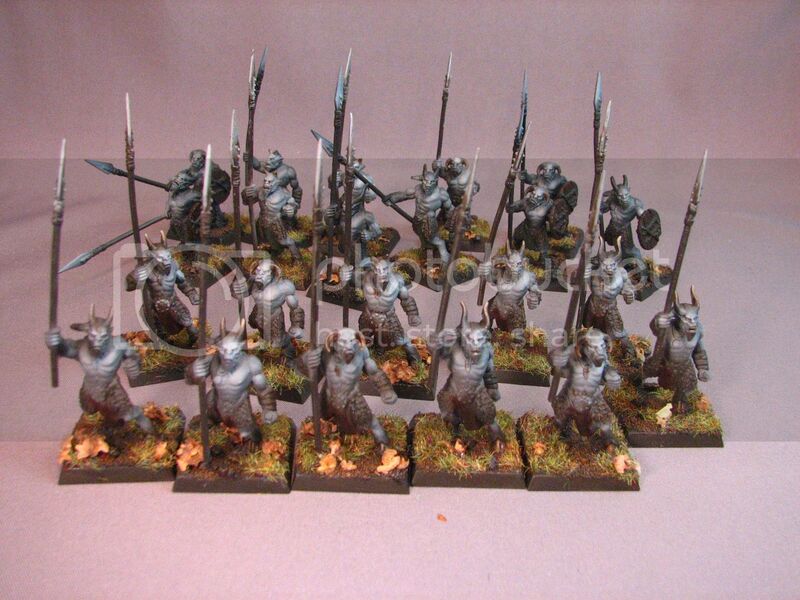 I "completed" a couple of 3 hour ungor herds - 22 models = 6 hours work!!!!! I didnt really put too much effort into these because 1) I was running out of time and 2) These were just some extra assembled ones I got in a lot from a buddy when I bought his beasts. It is fully my intent to finish converting my own ungors and/or use the new ungor models in the long term but for now - for the mixed herd setup it was get em done - and quite frankly they still look not too bad for rank fillers really. 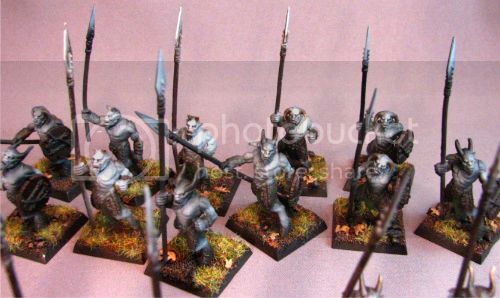 Yeah they are pale but, like the minos, they were done in time and met the colour requirements for the tournament without looking like complete @$$ :P (and adding the "space fillers" of my mordheim minotaur and the mid transformation spawn from my Morghur base really dressed the units up as well.) So for nil time and much to do I am generally pleased - they do their job of neither detracting nor jumping out from the models on the table allowing the pieces that are properly done to shine. I hope that in the new rules ungors will be useful as I actually look forward to doing my actual proper ungors to replace these. I have all centigor spear arms (got on that before bitz orders disappeared) for them so wont have to deal with the little bendy spears and I have several really cool conversions in various states of completion. Until then these will stand in. 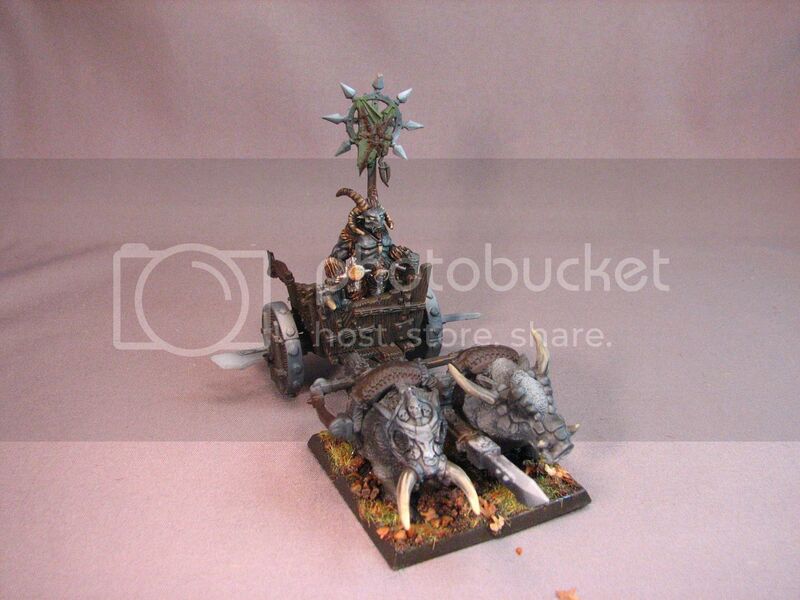 Long term I have a second one of the knarloc chariots to finish but I didnt want to rush that so this is an orc Chariot that I got in a pile of stuff from a buddy - I ripped off the drivers, changed the standard, pulled off the boar heads and used the one tuskgor head I could find in my bitzbox and a better looking ork special character boar head. When all was said and done I had a fully painted Beastmen army that functioned well as a whole. Between picking up enormous "soft" scores for painting and sportsmanship I actually managed to win two of my three games in the tournament. As such I came out statistically WAAAAAAY ahead of my opposition and was named the 2009 LOST GAMES CLUB WARHAMMER CHAMPION!!!!!!! WOOOOHOOO!! !